CARFAX One-Owner. Clean CARFAX. Certified. White Orchid 2016 Honda Accord Sport FWD CVT 2.4L I4 DOHC i-VTEC 16V Cloth. Odometer is 10276 miles below market average! 26/35 City/Highway MPG Honda Certified Pre-Owned Details: * Transferable Warranty * Warranty Deductible: $0 * Powertrain Limited Warranty: 84 Month/100,000 Mile (whichever comes first) from original in-service date * Roadside Assistance with Honda Care purchase * Limited Warranty: 12 Month/12,000 Mile (whichever comes first) after new car warranty expires or from certified purchase date * Vehicle History * 182 Point Inspection Awards: * ALG Residual Value Awards * 2016 KBB.com Brand Image Awards 2016 Kelley Blue Book Brand Image Awards are based on the Brand Watch(tm) study from Kelley Blue Book Market Intelligence. Award calculated among non-luxury shoppers. For more information, visit www.kbb.com. Kelley Blue Book is a registered trademark of Kelley Blue Book Co., Inc. Call us at 651-306-8600 or come visit Inver Grove Honda conveniently located at 4605 South Robert Trail, Inver Grove Heights, MN 55077. You may also visit us at www.InverGroveHonda.com 24/7. Your local President's Award winning dealership! CARFAX One-Owner. Crystal Black 2017 Honda Accord Sport w/Honda Sensing FWD CVT 2.4L I4 DOHC i-VTEC 16V Cloth. Recent Arrival! 26/34 City/Highway MPG Awards: * ALG Residual Value Awards * 2017 IIHS Top Safety Pick+ (When equipped with Honda Sensing and specific headlights) * 2017 KBB.com 10 Most Awarded Brands * 2017 KBB.com Brand Image Awards 2016 Kelley Blue Book Brand Image Awards are based on the Brand Watch(tm) study from Kelley Blue Book Market Intelligence. Award calculated among non-luxury shoppers. For more information, visit www.kbb.com. Kelley Blue Book is a registered trademark of Kelley Blue Book Co., Inc. Call us at 651-306-8600 or come visit Inver Grove Honda conveniently located at 4605 South Robert Trail, Inver Grove Heights, MN 55077. You may also visit us at www.InverGroveHonda.com 24/7. Your local President's Award winning dealership! Clean CARFAX. Certified. Black 2018 Honda Accord LX FWD CVT 1.5T I4 DOHC 16V Turbocharged VTEC Cloth. Honda Certified Pre-Owned means you not only get the reassurance of a 12mo/12,000 mile limited warranty, but also up to a 7yr/100k mile powertrain warranty, a 182-point inspection/reconditioning, and and a complete CARFAX vehicle history report. Recent Arrival! 30/38 City/Highway MPG Honda Certified Used Cars Details: * Vehicle History * 182 Point Inspection * Transferable Warranty * Roadside Assistance * Powertrain Limited Warranty: 84 Month/100,000 Mile (whichever comes first) from original in-service date * Warranty Deductible: $0 * Limited Warranty: 12 Month/12,000 Mile (whichever comes first) after new car warranty expires or from certified purchase date Call us at 651-306-8600 or come visit Inver Grove Honda conveniently located at 4605 South Robert Trail, Inver Grove Heights, MN 55077. You may also visit us at www.InverGroveHonda.com 24/7. Your local President's Award winning dealership! Clean CARFAX. Certified. Black 2018 Honda Accord LX FWD CVT 1.5T I4 DOHC 16V Turbocharged VTEC Cloth. Honda Certified Pre-Owned means you not only get the reassurance of a 12mo/12,000 mile limited warranty, but also up to a 7yr/100k mile powertrain warranty, a 182-point inspection/reconditioning, and and a complete CARFAX vehicle history report. Recent Arrival! 30/38 City/Highway MPG Honda Certified Used Cars Details: * Powertrain Limited Warranty: 84 Month/100,000 Mile (whichever comes first) from original in-service date * 182 Point Inspection * Warranty Deductible: $0 * Transferable Warranty * Limited Warranty: 12 Month/12,000 Mile (whichever comes first) after new car warranty expires or from certified purchase date * Vehicle History * Roadside Assistance Call us at 651-306-8600 or come visit Inver Grove Honda conveniently located at 4605 South Robert Trail, Inver Grove Heights, MN 55077. You may also visit us at www.InverGroveHonda.com 24/7. Your local President's Award winning dealership! CARFAX One-Owner. Clean CARFAX. Certified. Silver 2018 Honda Accord LX FWD CVT 1.5T I4 DOHC 16V Turbocharged VTEC Cloth. Recent Arrival! 30/38 City/Highway MPG Honda Certified Used Cars Details: * Warranty Deductible: $0 * Roadside Assistance * Vehicle History * Powertrain Limited Warranty: 84 Month/100,000 Mile (whichever comes first) from original in-service date * 182 Point Inspection * Limited Warranty: 12 Month/12,000 Mile (whichever comes first) after new car warranty expires or from certified purchase date * Transferable Warranty Call us at 651-306-8600 or come visit Inver Grove Honda conveniently located at 4605 South Robert Trail, Inver Grove Heights, MN 55077. You may also visit us at www.InverGroveHonda.com 24/7. Your local President's Award winning dealership! Clean CARFAX. Certified. Gray 2018 Honda Accord LX FWD CVT 1.5T I4 DOHC 16V Turbocharged VTEC Cloth. 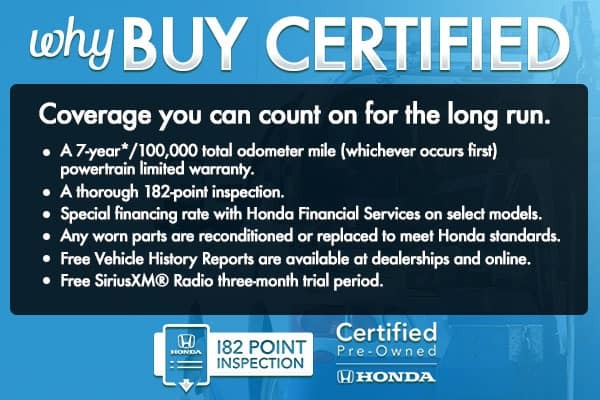 Honda Certified Pre-Owned means you not only get the reassurance of a 12mo/12,000 mile limited warranty, but also up to a 7yr/100k mile powertrain warranty, a 182-point inspection/reconditioning, and and a complete CARFAX vehicle history report. Recent Arrival! 30/38 City/Highway MPG Honda Certified Pre-Owned Details: * Limited Warranty: 12 Month/12,000 Mile (whichever comes first) after new car warranty expires or from certified purchase date * Transferable Warranty * Roadside Assistance with Honda Care purchase * Warranty Deductible: $0 * Vehicle History * 182 Point Inspection * Powertrain Limited Warranty: 84 Month/100,000 Mile (whichever comes first) from original in-service date Call us at 651-306-8600 or come visit Inver Grove Honda conveniently located at 4605 South Robert Trail, Inver Grove Heights, MN 55077. You may also visit us at www.InverGroveHonda.com 24/7. Your local President's Award winning dealership! Clean CARFAX. Certified. Red 2018 Honda Accord LX FWD CVT 1.5T I4 DOHC 16V Turbocharged VTEC Cloth. Recent Arrival! 30/38 City/Highway MPG Honda Certified Pre-Owned Details: * Powertrain Limited Warranty: 84 Month/100,000 Mile (whichever comes first) from original in-service date * Vehicle History * Transferable Warranty * Roadside Assistance with Honda Care purchase * Limited Warranty: 12 Month/12,000 Mile (whichever comes first) after new car warranty expires or from certified purchase date * 182 Point Inspection * Warranty Deductible: $0 Call us at 651-306-8600 or come visit Inver Grove Honda conveniently located at 4605 South Robert Trail, Inver Grove Heights, MN 55077. You may also visit us at www.InverGroveHonda.com 24/7. Your local President's Award winning dealership! CARFAX One-Owner. Clean CARFAX. Certified. 2017 Honda Accord Sport FWD CVT 2.4L I4 DOHC i-VTEC 16V Cloth. Recent Arrival! Odometer is 647 miles below market average! 26/34 City/Highway MPG Honda Certified Pre-Owned Details: * Roadside Assistance with Honda Care purchase * Vehicle History * Limited Warranty: 12 Month/12,000 Mile (whichever comes first) after new car warranty expires or from certified purchase date * Powertrain Limited Warranty: 84 Month/100,000 Mile (whichever comes first) from original in-service date * 182 Point Inspection * Transferable Warranty * Warranty Deductible: $0 Awards: * ALG Residual Value Awards * 2017 IIHS Top Safety Pick+ (When equipped with Honda Sensing and specific headlights) * 2017 KBB.com Brand Image Awards * 2017 KBB.com 10 Most Awarded Brands 2016 Kelley Blue Book Brand Image Awards are based on the Brand Watch(tm) study from Kelley Blue Book Market Intelligence. Award calculated among non-luxury shoppers. For more information, visit www.kbb.com. Kelley Blue Book is a registered trademark of Kelley Blue Book Co., Inc. Call us at 651-306-8600 or come visit Inver Grove Honda conveniently located at 4605 South Robert Trail, Inver Grove Heights, MN 55077. You may also visit us at www.InverGroveHonda.com 24/7. Your local President's Award winning dealership! CARFAX One-Owner. Clean CARFAX. Certified. Crystal Black 2016 Honda Accord EX-L FWD CVT 2.4L I4 DOHC i-VTEC 16V Leather. Recent Arrival! Odometer is 5603 miles below market average! 26/35 City/Highway MPG Honda Certified Pre-Owned Details: * Roadside Assistance with Honda Care purchase * Warranty Deductible: $0 * Transferable Warranty * Limited Warranty: 12 Month/12,000 Mile (whichever comes first) after new car warranty expires or from certified purchase date * Powertrain Limited Warranty: 84 Month/100,000 Mile (whichever comes first) from original in-service date * 182 Point Inspection * Vehicle History Awards: * ALG Residual Value Awards * 2016 KBB.com Brand Image Awards 2016 Kelley Blue Book Brand Image Awards are based on the Brand Watch(tm) study from Kelley Blue Book Market Intelligence. Award calculated among non-luxury shoppers. For more information, visit www.kbb.com. Kelley Blue Book is a registered trademark of Kelley Blue Book Co., Inc. Call us at 651-306-8600 or come visit Inver Grove Honda conveniently located at 4605 South Robert Trail, Inver Grove Heights, MN 55077. You may also visit us at www.InverGroveHonda.com 24/7. Your local President's Award winning dealership! CARFAX One-Owner. Clean CARFAX. Certified. Crystal Black 2016 Honda Accord EX-L FWD CVT 2.4L I4 DOHC i-VTEC 16V Leather. Recent Arrival! Odometer is 13549 miles below market average! 27/37 City/Highway MPG Honda Certified Pre-Owned Details: * Warranty Deductible: $0 * Limited Warranty: 12 Month/12,000 Mile (whichever comes first) after new car warranty expires or from certified purchase date * Roadside Assistance with Honda Care purchase * Powertrain Limited Warranty: 84 Month/100,000 Mile (whichever comes first) from original in-service date * 182 Point Inspection * Transferable Warranty * Vehicle History Awards: * ALG Residual Value Awards * 2016 KBB.com Brand Image Awards 2016 Kelley Blue Book Brand Image Awards are based on the Brand Watch(tm) study from Kelley Blue Book Market Intelligence. Award calculated among non-luxury shoppers. For more information, visit www.kbb.com. Kelley Blue Book is a registered trademark of Kelley Blue Book Co., Inc. Call us at 651-306-8600 or come visit Inver Grove Honda conveniently located at 4605 South Robert Trail, Inver Grove Heights, MN 55077. You may also visit us at www.InverGroveHonda.com 24/7. Your local President's Award winning dealership! CARFAX One-Owner. Clean CARFAX. Certified. Red 2018 Honda Accord LX FWD CVT 1.5T I4 DOHC 16V Turbocharged VTEC Cloth. Recent Arrival! 30/38 City/Highway MPG Honda Certified Pre-Owned Details: * Warranty Deductible: $0 * 182 Point Inspection * Transferable Warranty * Powertrain Limited Warranty: 84 Month/100,000 Mile (whichever comes first) from original in-service date * Vehicle History * Roadside Assistance with Honda Care purchase * Limited Warranty: 12 Month/12,000 Mile (whichever comes first) after new car warranty expires or from certified purchase date Call us at 651-306-8600 or come visit Inver Grove Honda conveniently located at 4605 South Robert Trail, Inver Grove Heights, MN 55077. You may also visit us at www.InverGroveHonda.com 24/7. Your local President's Award winning dealership!